One week into my cleanse, and I think it’s finally safe to say that I’m successfully over the hump. Caffeine withdrawals have subsided and sugar cravings are a thing of the past. I had a dream last night that I ate a huge ice cream cone followed by a milkshake (lol) and I was so upset with myself. This clean eating lifestyle has officially seeped into my subconscious, but I’d be lying if I told you I wasn’t counting down the hours until my first glass of wine this weekend. 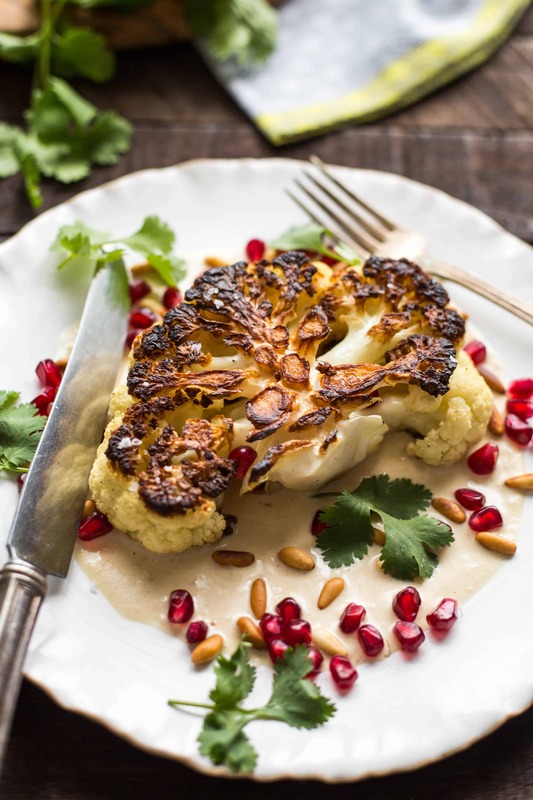 This recipe for cauliflower steaks with tahini and pomegranate is exactly the sort of thing that I’m eating right now. And as much as I miss my beloved sugar and gluten, I have to say, it’s not really all that bad. Clean eating doesn’t have to be boring, but it can be a lot of work. It takes changing your mindset, a lot of planning, a lot of grocery shopping, and obviously a lot of cooking. But if you take the time to be mindful about doing all of those things, it can actually be really delicious. My days have been filled with flavorful soups, egg and veggie sautes, colorful whole grain bowls and lots of these northern Italian chick pea pancakes called Farinata (recipe coming Friday!). In addition to coffee and booze, I’ve cut out refined sugar, gluten, and (most) dairy, mainly to see how it affects my rosacea, a rosy red rash on my face that I’m convinced is aggravated by my love affair with all of those things. So far, my skin has been looking great, and it’s only been a week. Now comes the fun part of trying to decipher which of those is actually the culprit. You can make yourself crazy cutting out literally every single food group from your diet, but unless you’re fighting cancer or another ailment, I believe moderation is key. If you’re sacrificing flavor, you’ll never be able to sustain it. This recipe can mostly be categorized as “allergy free”. The tahini sauce is perhaps the only thing that could be a potential allergen, barring any random fruit/veggie allergies (and no, hating cilantro doesn’t count). But even those with nut allergies can usually tolerate tahini, which is made from sesame seeds, as well as pine nuts, which are also technically a seed (and can easily be omitted if there’s an issue). I think it’s safe to say this one is a win-win-win-win-win. 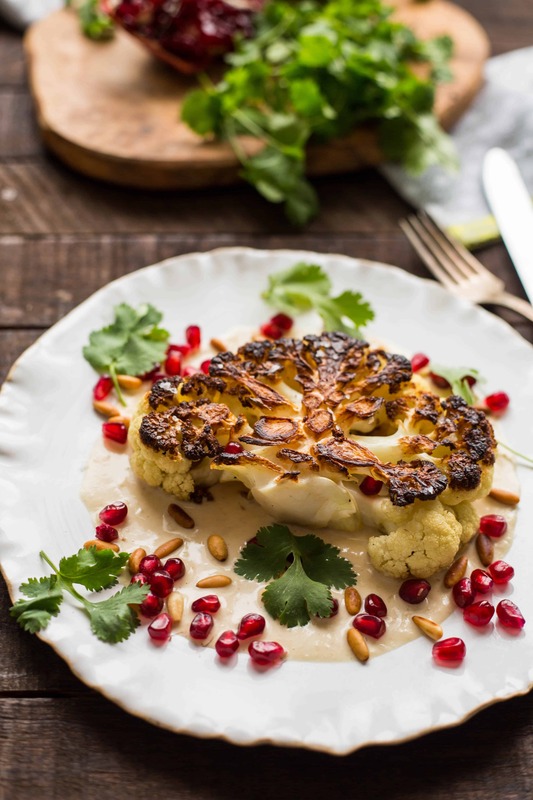 Cauliflower steaks are kinda genius. I’d seen recipes for them before, but wasn’t sold until I tried one for the first time back in September at Steve + Cookies, my favorite local restaurant. I tried the whole roasted cauliflower thing before, but it didn’t impress me nearly as much as these steaks. 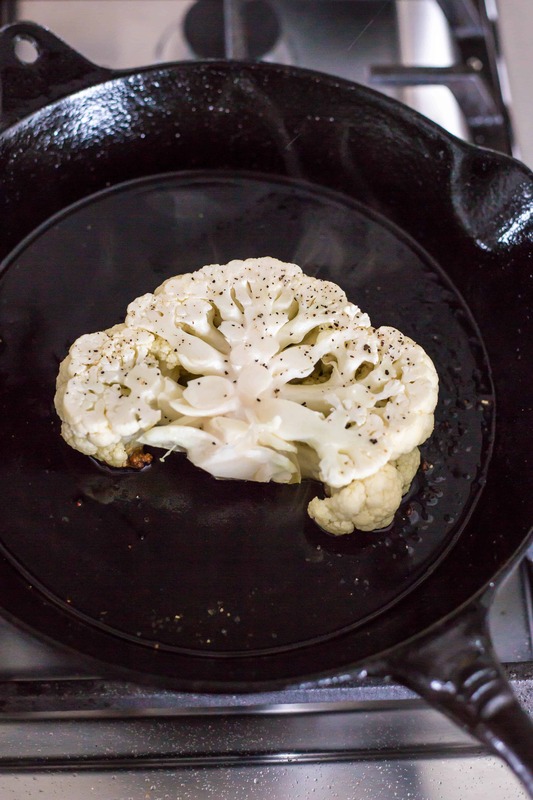 Thick slices of cauliflower are seared in a hot cast iron skillet until the outsides are incredibly browned and the insides are just tender. Cast iron works best for this since it retains heat so well, but any good heavy bottomed skillet will work. 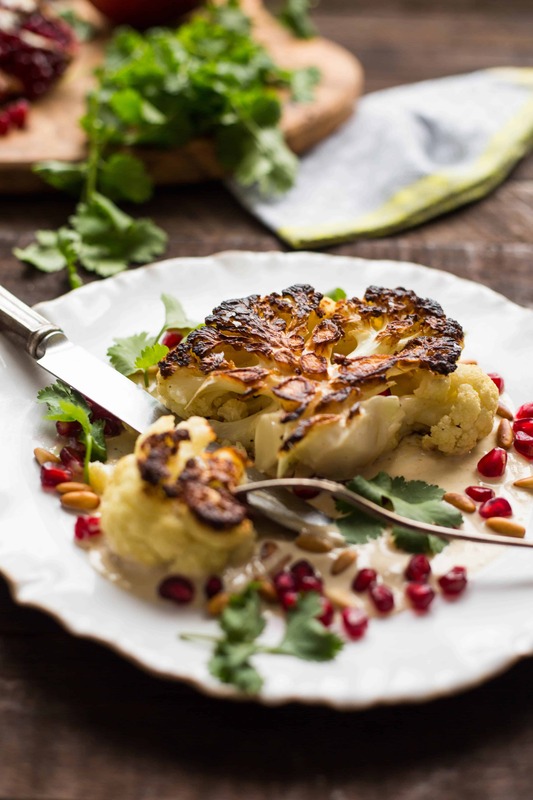 You want to bring the cauliflower almost to the point of being burnt – that’s when it develops that super caramelized flavor and ultra crispy texture. The tahini sauce is creamy and slightly bitter with a pungent pop of garlic and lemon. Simple, but powerful. 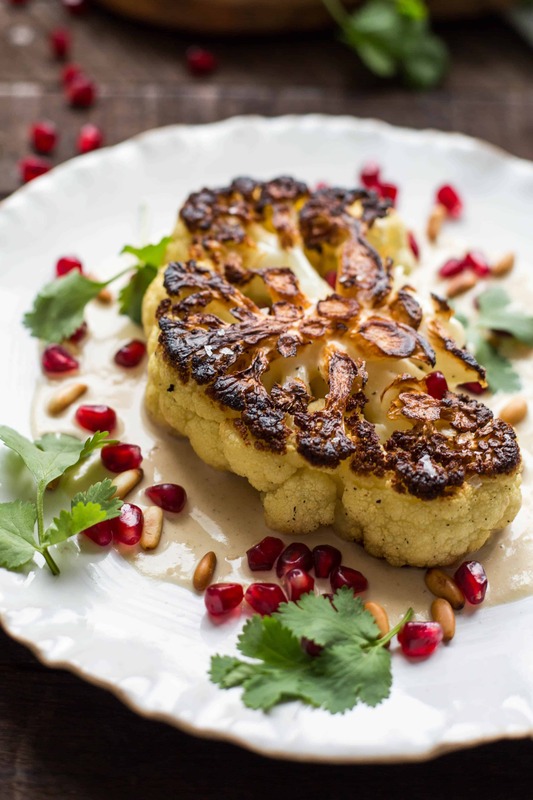 It makes an excellent accompaniment to the charred cauliflower, and is further complimented by the sweet and tangy pomegranate arils. They also add gorgeous color to the plate. Don’t skip them! Toasted pine nuts and cilantro give the final touches to this satisfying dish. If you’re not a fan of cilantro, fresh mint would work exceptioanlly well, and in fact, maybe even better. I love this dish as a vegetarian main, but it could work really well as a side dish, too. Just whack the steaks up into smaller pieces and you’re good to go. This recipe is totally vegan, gluten free AND Paleo, but most importantly, it tastes like something just about anyone would want to eat. Combine the garlic, lemon, tahini and salt in a bowl. Whisk together and add cold water, a tablespoon at a time while whisking. The mixture will seize up at first. Keep whisking and adding water until it forms a smooth, saucy consistency. Taste for seasoning and adjust with more lemon and salt as needed. Place the cauliflower stalk-side-down on a cutting board and trim 1/4 off the edge on either side. Cut two thick slices (about 1 1/2-2 inches) out of the middle, then save the remaining crumbled edge pieces for another use (like soup or a salad). Preheat the oven to 350 degrees and place a sheet pan inside to heat up. Heat 3 tablespoons olive oil in a large cast iron skillet over high heat. 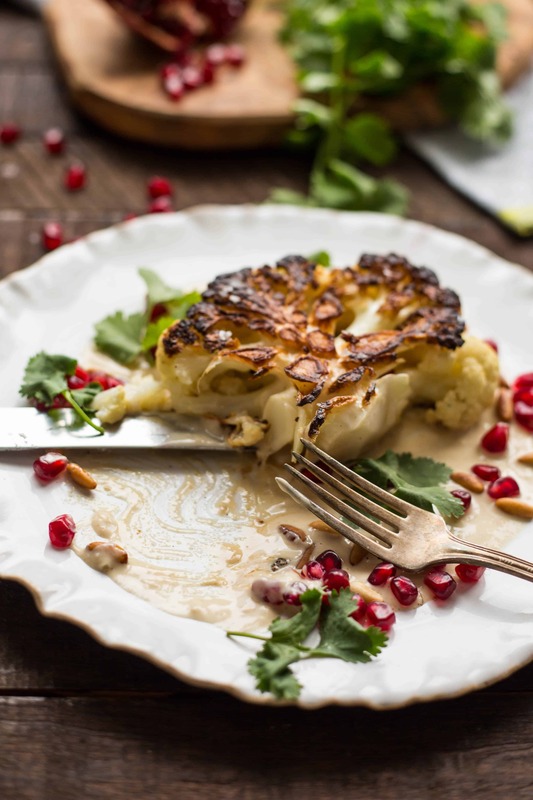 Season the cauliflower steaks on both sides with salt and pepper, then carefully place one in the hot pan. Reduce the heat to medium-high and let cook until dark brown, about 5 minutes. Carefully flip and cook until dark brown on the other side. Transfer to the oven, then pour the remaining tablespoon of olive oil in the pan and repeat with the remaining cauliflower steak. The steaks are done when a knife can easily pierce the middle of each. 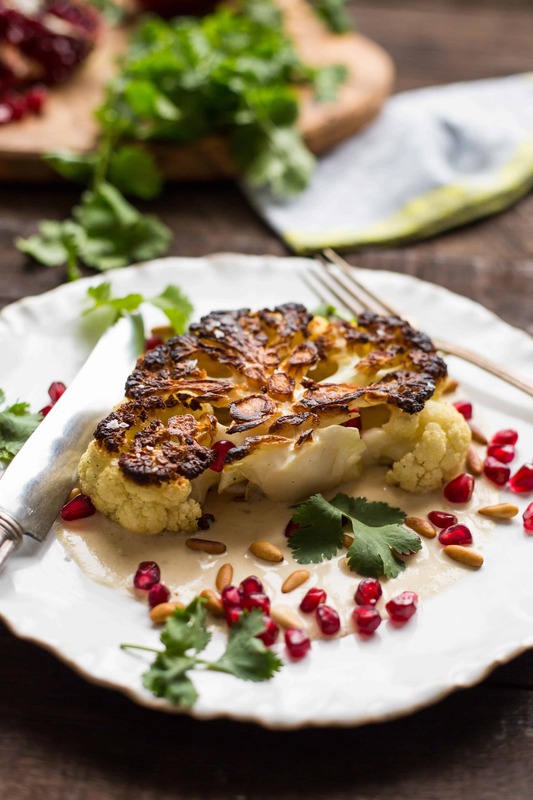 Spoon a generous amount of tahini sauce on each plate, then place the cauliflower steaks on top. 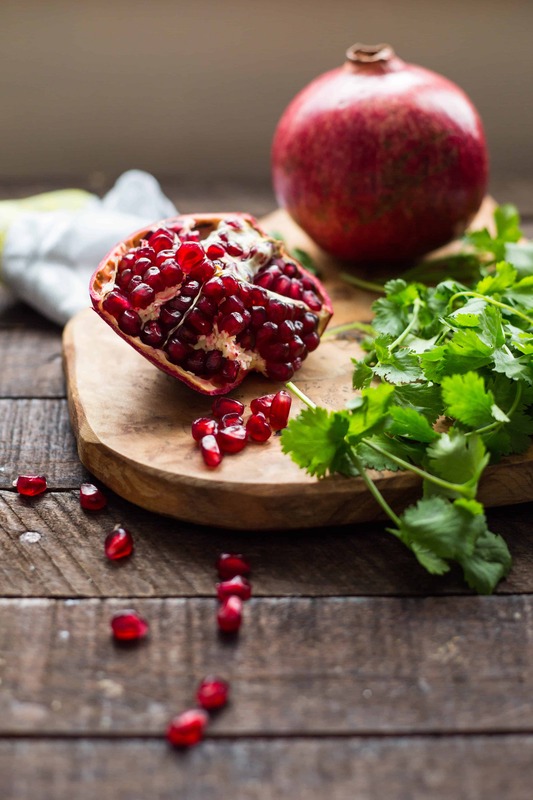 Sprinkle with flaky sea salt, then scatter the pomegranate arils and pine nuts all around. Garnish with a few cilantro or mint leaves, and serve immediately. I just made a cauliflower and tahini salad today (though with farro, so not gluten free) and I love the combination of the two flavors. I didn’t think of pomegranate, but I can imagine that they bring it to the next level! Your talk about doing a cleanse is reminding me that I usually do a no sugar/no drinking month at the beginning of the year. I do have a couple of sugary blog posts to deal with this weekend, but you have inspired me! A sugar-free/wine-free month is coming up. Oh, farro sounds like such a lovely addition! I’ve been going crazy with the tahini lately, can’t seem to get enough of it. So, did you start that cleanse?? I’m curious to hear how it’s going!